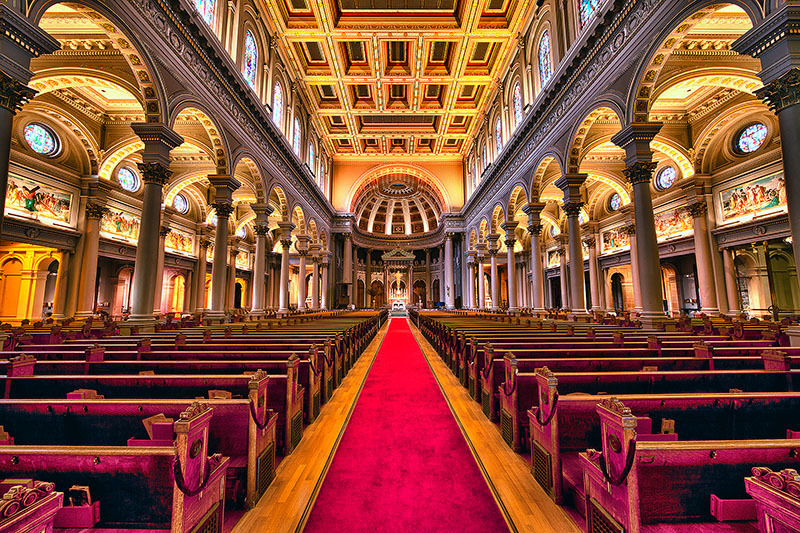 Some time ago, I was in San Francisco and stopped at St. Ignatius church. This is a really beautiful church and was fun to shoot. – You’ll definitely need a tripod. It’s a good idea to call ahead and get permission to use it indoors. – Generally, you’ll want to use a very wide angle lens. I used Canon’s 14mm with a full frame sensor for this shot. – Shoot with a lot of depth of field. I used F22, since I wanted everything in focus, including the pews in the foreground and the columns in the background. – Use HDR, or High Dynamic Range processing. There are books written about HDR, but the basic idea is to shoot multiple exposures and then use software to blend the exposures so that everything is exposed reasonably well. This is helpful in churches because the lighting contrast is so extreme. HDR photos do have an artificial look to them which you may or may not like. – Important! Pay very close attention to your position. If you are trying to shoot straight on, such as in this shot, look at the corners and lines to make sure everything lines up. I was close, but not perfect, on this shot. With an ultra-wide lens, even a few inches to one side or a very slight tilt of the camera will distort the perspective. In this case, I wanted the same amount of column on each side of the image and the lines on the ceiling to be as straight as possible. I watched the corners and edges of the frame closely while setting up the composition. – Use the manual setting on the camera. After setting your aperature, adust the shutter speed until you have a good exposure for the brightest part of the image, most likely the stained glass windows. Make sure they have good color and are exposed well. The rest of the picture will be really dark. Then, take subsequent shots while decreasing the shutter speed to allow more light. I do this in 2/3s of a stop increments. Make sure not to move the tripod between shots. When the darkest part of the image is exposed properly, you are done shooting that composition. The windows will be completely blown out, but the shadows should be exposed properly. – After you are finished shooting, use HDR software to blend the pictures. Photoshop has HDR, although there are other options. I use Nik Filters’ HDR software and like the results I get better than with Photoshop. Photomatix is a very popular option. Even if you don’t have this software now, take the multiple exposures and you can process them later if/when you get the software. – If you process in Photoshop or use filters, try increasing the contrast and enhancing the color a bit. I used Nik Filters “Pro Contrast” and “Brilliance/Warmth” filters for this shot. Posted in Processing Tips, Tips and Tricks on July 6, 2013 October 15, 2013 by Ken Koskela.